Thank you to New Seasons Market for sponsoring this post! January celebrates the ushering in of citrus season! I always get excited to see the fresh crops pour into the produce section of my local grocery stores and roadside fruit stands. I LOVE practically anything with citrus-flavored and love experimenting with news ways of using the full range of citrus fruits. 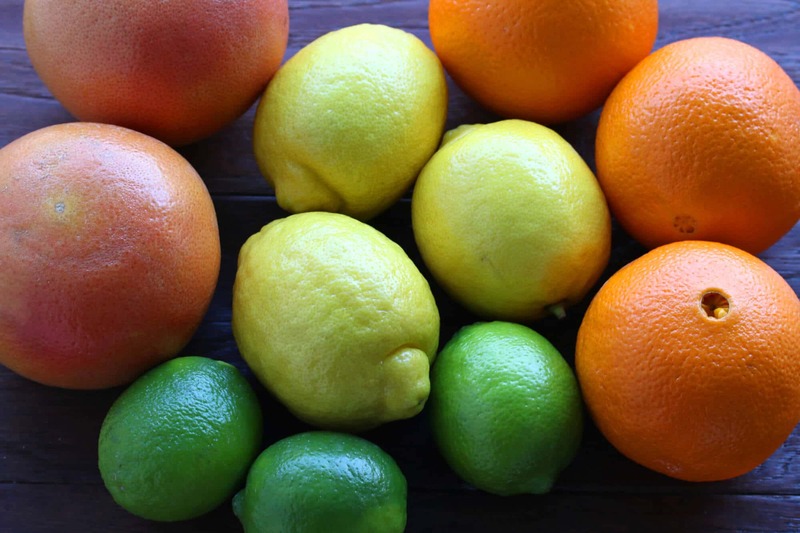 There’s a dazzling variety of citrus on the market, more than most realize and each have unique flavor elements. Just to give you an example, here are a few varieties of just orange and tangerines alone: Bergamot, blood, Cara Cara, Hamlin, Seville, Valencia, clementine, enCore, Fairchild, Fremont, gold nugget, honey, Kara, Lee, Murcott, Page, pixie, sunburst and satsuma. Wouldn’t it be fun to have each of these side by side and taste each one for comparison? 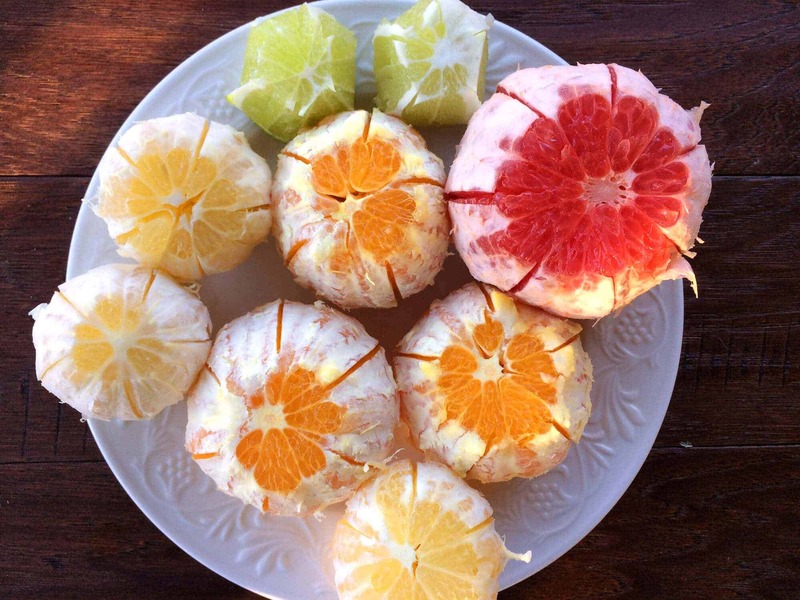 Not to mention the different varieties of grapefruit, lemons, limes and other forms of citrus like kumquats, tangelos, pummelos and unique fruit (aka, ugli fruit). New Season Market on Mercer Island, WA recently had a taste testing event featuring many these varieties – so fun! Today we’re going to make delicious use of a portion of the citrus fruit you may normally discard by making candied citrus peels. Think of these delightful sweet treats like citrus flavor on steroids! While candied orange and candied lemon are the the most commonly used, candied grapefruit and lime also have a delicious place in the mix and I’m going to demonstrate the process using those as well. There are a few reasons you should make your own: 1) The store-bought stuff is generally not organic. 2) It’s made with chemicals. 3) It’s not fresh. 4) Most of it tastes bad. Like really bad. I regularly have readers request recommendations for good brands of candied citrus and the best recommendation that I can offer is make your own! Because once you do and taste the difference, you’ll never buy it again. The good news is, it is SO easy to make your own! And it keeps for a long time, especially if you freeze it. The flavor is 100% better than store-bought and will bring your baked goods to life. 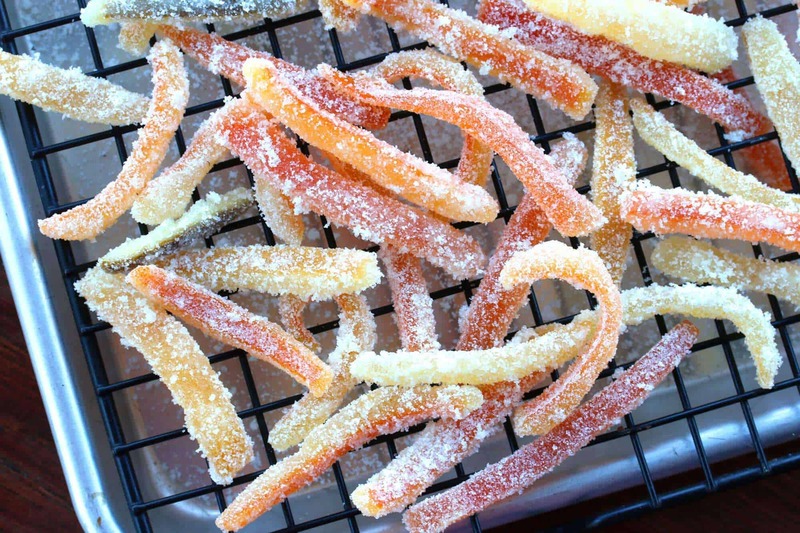 So that leads us to the question of how do you use candied citrus? Chopped up and added to cookies, cakes, muffins, cupcakes, scones, etc. and whatever else your imagination can think of! 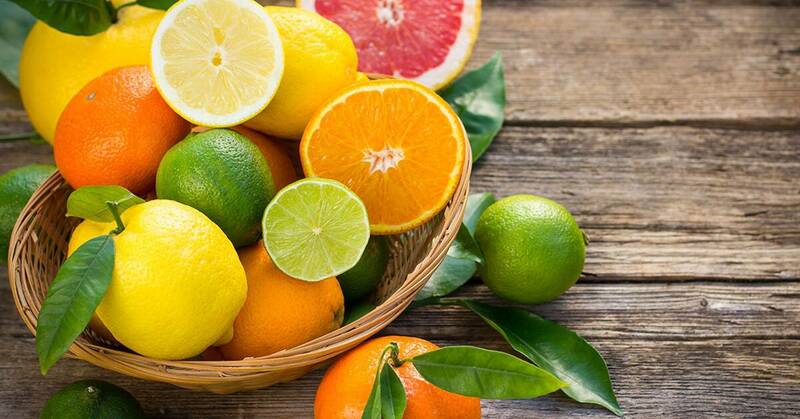 Select the best citrus fruits possible and give them a thorough scrubbing and washing. We’re not sticklers about buying all of our produce organic, but we do stick to organic for certain items that are highly sprayed and/or waxed. And in the case of citrus fruits, if I’m using the peels for zesting or candying, I use and recommend organic. Slice both ends of the orange. Cut the peel on each each into 4 or more vertical segments, depending on the size of the fruit. Peel off each segment of rind. You can remove a little of the white pith, though not necessary. The process is the same for any citrus fruit. Slice the peels into 1/4 inch wide strips. Keep the peeled citrus for eating, cooking or juicing. Boil the peels in water in a pot for 15 minutes. Drain the peels in a colander, rinse and then drain again. Discard the water from the pot. Add the sugar and fresh water to the pot and bring it to a boil. Boil it for a couple of minutes until the sugar is dissolved. Add the citrus peels, reduce the heat and simmer for 45 minutes, stirring occasionally, until the peels become translucent. Use a slotted spoon to remove a few of the peels at a time and let the excess syrup drip off for a few seconds. Place the hot, wet peels in the bowl of sugar and toss to coat. Spread the candied citrus peels out on a wire rack to cool and dry completely, 1-2 days. Note: If you find your candied citrus peel gets hard after a while don’t worry – they will soften up beautifully as they bake in whatever recipe you add them to! Finally, DON’T DISCARD THE CITRUS SYRUP! This is a wonderful citrus-flavored simple syrup to add to your drinks for a wonderful kick of citrus flavor! Candied citrus peel is easy to make yourself, contains no chemicals or additives, and tastes MUCH better than store-bought! Boil the peels in a pot of water for 15 minutes. Drain the peels in a colander, rinse and then drain again. Discard the water from the pot. Add the fresh water and sugar to the pot and bring it to a boil. Boil it for a couple of minutes until the sugar is dissolved. Add the citrus peels, reduce the heat and simmer for 45 minutes, stirring occasionally, until the peels become translucent. 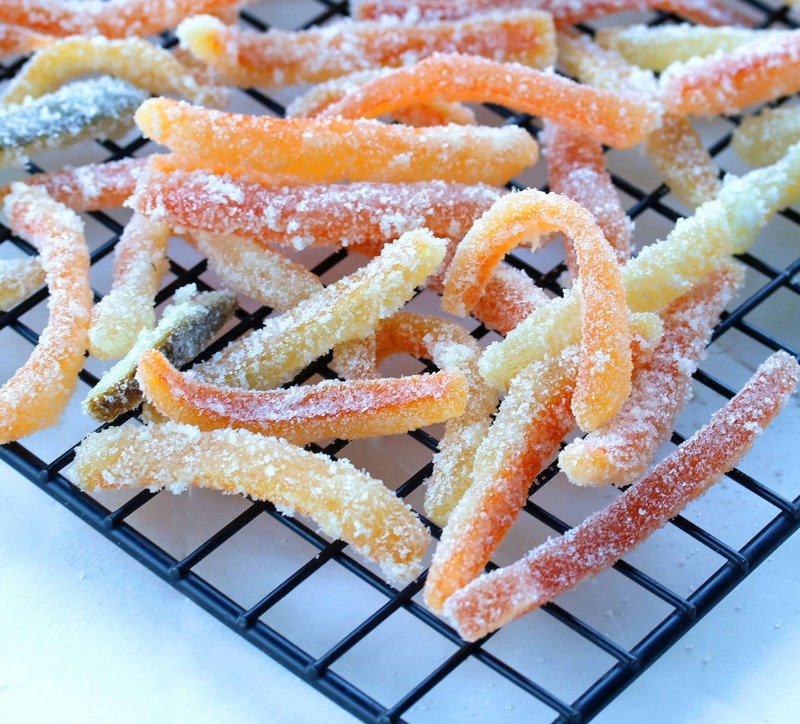 Stored in an airtight container in a cool, dry place, the candied citrus peel will keep for at least a month. They'll keep even longer in the fridge and for a few months frozen.Note: If you find your candied citrus peel gets hard after a while don't worry - they will soften up beautifully as they bake in whatever recipe you add them to! *DON'T DISCARD THE CITRUS SYRUP! 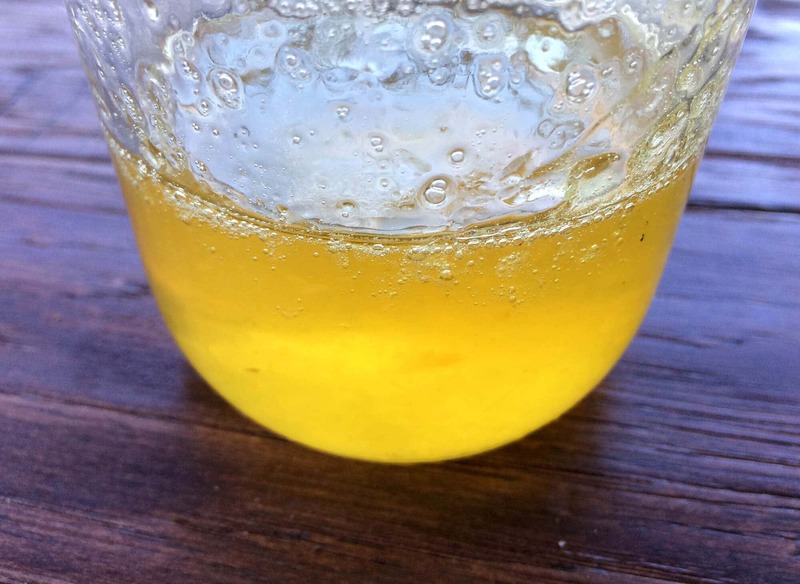 This is a wonderful citrus-flavored simple syrup to add to your drinks for a wonderful kick of citrus flavor! 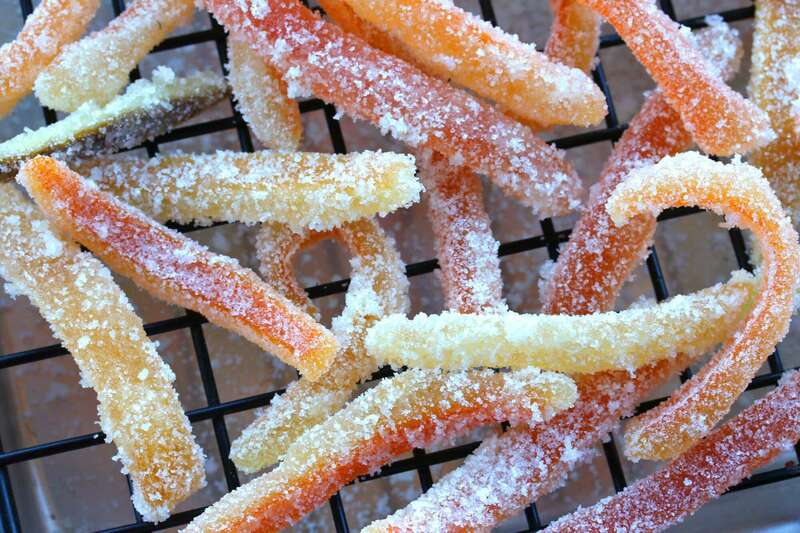 *If you'd like to make more candied citrus peel, simply increase the amount of water and sugar by the same 1:2 ratio. Thank you to New Seasons Market for sponsoring this post. I loved reading through this! And the photos made me feel so refreshed, I love fruit! Love this so much and I have to pop over for the citrus tasting – it sounds so great!! So interesting! I never knew the process, with boiling, simmering, etc. I’m definitely going to try this!! I’ve always wanted to try this…I need to buck up and do it. I haven’t had a chance to visit a New Seasons Market yet (hoping for one to open up on eastside Seattle), but I’ll have to make a trip to the Mercer Island location. 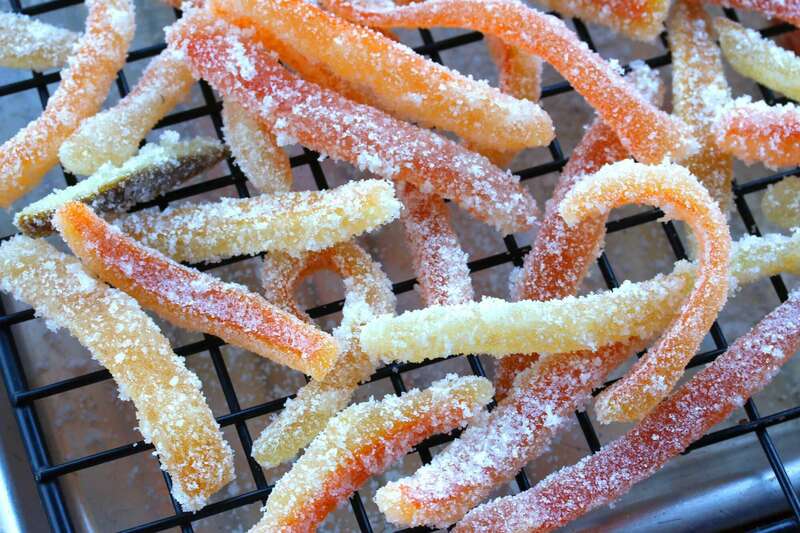 I know my family would love these candied peels! Fantastic! Great way to use everything! I love citrus season. I love your use for rinds…they look so good when they are candied. Citrus season is the best! Loving this! I absolutely love candied peel! And these look amaaazing!! Thanks! The recipe ingredient list states 2 cups sugar, 1 cup water. Your directions state water to sugar ratio is 2:1 which is the opposite of the ingredient list. Hi Anna, I couldn’t find that reference in the directions but I saw it in the recipe notes. Yes, that should be reversed like the ingredients list states. Thanks for catching the reference in the notes section. I needed this at Christmas when I attempted to make some candied orange peels to sprinkle on my lebkuchen. The recipe I used was slightly different and I ended up with a sticky disaster. I guess this is a sign that I should try again! Mallory, yes! I just linked my Lebkuchen recipe to this candied citrus post. Nothing compares to using homemade citrus peel in Lebkuchen! Kimberly, thank you! I’ve been intimidated for 25-years studying various recipes to make Lebkuchen for my German husband (Nuremberg) and your recipe was worth the wait! Perfect in everyway, including simplicity, and we just ate the first three fresh from the oven and dipped. Seriously, who can wait! THANK YOU tomorrow is his birthday and what a gift!! Wonderful, Care’n, I’m absolutely thrilled to hear that, thank you! This is so much easier than I would have thought! What a great idea! These look like a perfect treat! No way. This recipe is the bomb. I must do this with my kids ASAP. Perfect looking peel! I have actually never liked the bought candied citrus peel, but it never occured to me to make my own, I just left it out of every recipe that required some. I think I would like to try this. I sure wished I lived in the Seattle area! 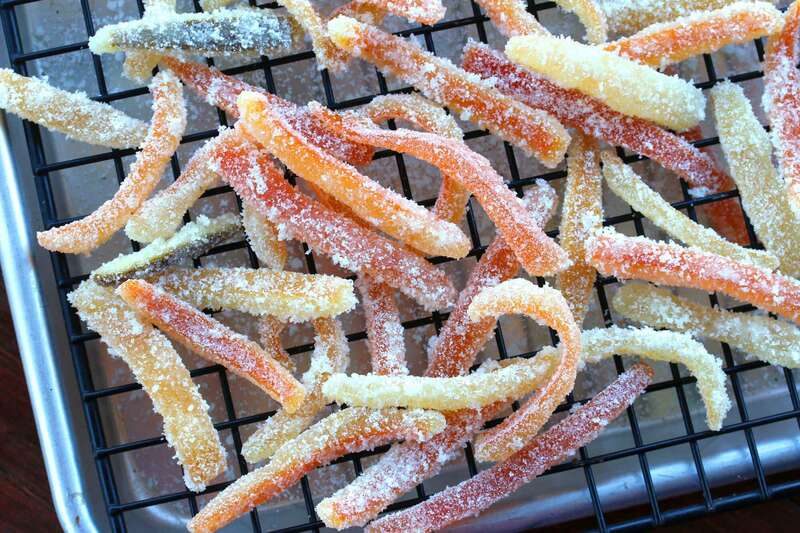 And love the looks of these candied citrus peels. So pretty! I tried this to add as a topper to some lemon bites. But I lost the first batch as I turned my attention elsewhere for a truly short time and the sugar syrup burned and turned everything to brown rocks. This happened long before 45 minutes. Up early next morning I tried again, this time stirring much more than called for. Again, the syrup turned to sugar after 30 minutes but fortunately I caught it. I was able to rub the cooked sugar off and use them. I’m not an experienced candy maker. Anybody got an idea what I did wrong? They are beautiful and I will try again. Hi Suzanne, I’m glad the second batch turned out. It sounds like it’s probably a temperature issue, that you may have had it too high. You’ll want to reduce the heat and keep the peels at a low simmer. Omg kids big and small love these. I also went step further and after the simmering I cut in 1 1/2″ prices and instead of coating in just sugar I mixed 1/2 sugar 1/2 jolly rancher jello mix and got sour patch pieces. Want more sour less sweet omit sugar. Yummy. Thank you for original recipe. I’m one to always go with original then make up my own. Some work great some some flop. That’s groovy, Donna, I’ve always been a fan of sour candies (I’ve used citric acid in the past for homemade), thanks for sharing! I’ve been making all of the above for years only thing i do differently is i add the juice from the fruit to the simple syrup what a difference that nakes in the taste. i do lemons, limes, oranges and grapefruits people.love them. I’ve just made these and they’re perfect! I’ll be using them in my homemade mincemeat recipe ready for Christmas. Thank you! Can I put these in a dehydrator instead of waiting two days? I’m in a very small apartment and can’t spare the table that long. Hi April, that’s a good idea and yes, that should work perfectly. Just put it on the lowest heat setting. Thank you, and it did! The peel is amazing. I would love to make them but it got very high calories, 1641 per serving! Hi Maggie, the nutrition info (incl. calories) for this recipe isn’t per individual serving, it’s for the entire batch of candied citrus peel. Daring Gourmet is my go-to for German cookies. The Lebkuchen and Pfeffernusse are amazing. I’m back again for the candied citrus peel recipe. I would have had enough for a second batch of lebkuchen, but come to find out, my partner has been eating the leftover citrus peel all month. The leftover citrus syrup has been great in cocktails. Thanks for sharing your awesome recipes! I’m thrilled to hear that, Joyce, thank you so much! I had a little trouble when I made a batch of this for Lebkuchen; I discovered that for every handful of the citrus peel, there would be one or two strips that were extremely tough; very difficult to chew. Do you know what might have caused that? I was still able to use most of the batch just fine, I just had to check each piece before I used it. I made it all in one batch, so I wonder if I might have just gotten an orange with a really tough peel, or something like that? Hi Jade, I’ve had the same thing happen to me and I’m not really sure why some turn out that way. It may very well have to do with the peel of one particular orange or lemon. I’ve still be able to use them in baked goods though because they soften in the batter and while the goods are baking. Question – Being that Citrus for us Northeners only comes around after Christmas (Jan. – Feb.) Would I not be able to vacumn seal these citrus candies and extend their freshness beyond a month so that I could use them when Christmas comes around again? That’s a great question, Kelly. I haven’t tried vacuum-sealing them but what I do for long-term storage is freeze them. Thank you for the recipe! My son is serving in the Navy, and is out to sea right now. He sent me a email this morning requesting candied lemon peels and brownies! Of course I am happy to oblige his request! Making a triple batch, as he always shares the goodies I send him with other sailors! That’s fantastic, Karin, you’re such a great mom! Best wishes to your son and I hope he and his comrades enjoy the goodies! This looks just what I’m looking for!!!!! I want some candied peel for my Christmas Cake. I’m goin’ in!!!!!! You’re welcome, Helen, I hope you enjoy both recipes! Thanks so much for this! I would just like to note that if you are in the Midwest United States in the middle of November, finding organic citrus can be a difficult (and expensive) endeavor. That being said, I found the best and cheapest organic oranges at ALDI, and I think there’s something poetic about starting my stollen journey there. Awesome, Becca! I miss Aldi in Germany. They need to build some in the Pacific Northwest! Those homemade Stollen are going to be A-mazing with that homemade candied citrus peel!! – the extra boiling is to get rid of the bitter taste. If you like bitter (and I do), no need. A bit like chewing on crunchy shards of marmalade. – leaving the inside pulp from the lemon as well as the white under the skin makes for a moister product which takes longer to dry, but tastes fine. I next tried thin slices of the whole fruit, and again, the additional moisture changes the balance, but adds sweetness to the bitter of the white pulp. – don’t know how well this will keep, but as we keep eating it, I don’t know if I’ll ever find out. Don’t know how it would work in recipes calling for candied peel – might be too moist. Any experience with this? Thanks so much for these insights and feedback, Veronica. I personally prefer the peels more sweet than bitter so I opt for removing the white pith. As a result, yes, the candied peels are drier/harder but soften up nicely when added to other recipes. And conversely yes, they will be softer and more moist with the pith left on. This latter texture is more reminiscent of store-bought citrus peel and shouldn’t be a problem at all when you add them to baked goods. For storage, I usually keep them refrigerated in an airtight container or ziplock bag and if I end up going through them very slowly (which rarely happens), I put them in the freezer. I have been really enjoying all of your recipes after I discovered your site when I was searching for an authentic Lebkuchen recipe. Making the Lebkuchen tonight! I have been making candied peels for years (and other candied fruits—this year I tried pears and a whole pineapple), and I wanted to share a little discovery I made this holiday season. I made some grapefruit, too, but the pith didn’t come loose in the raw state, so I blanched it once and the pith came right out with a spoon. Considering that I candy big batches (a few dozen fruits at a time) it takes a while to cut up and clean up the peels. This new spoon method goes much faster and I found it even results in fresher tasting and more intense fruit peels. By the way – love this site. Thanks. Thanks so much, Jim, both for the compliment and for sharing those helpful tips! Thank you for this – great recipe, clear instructions, and fab end result. A bit time consuming at the dipping in sugar stage, but end result was worth it. Will look forward to mot wasting any orange or lemon peel in future☺. Never too late to try. I am a 75 yr old male who is still interested in all types of cooking and am going out right now to buy some fruit to try your deliciously sounding recipe. Thank you so much. Wayne. 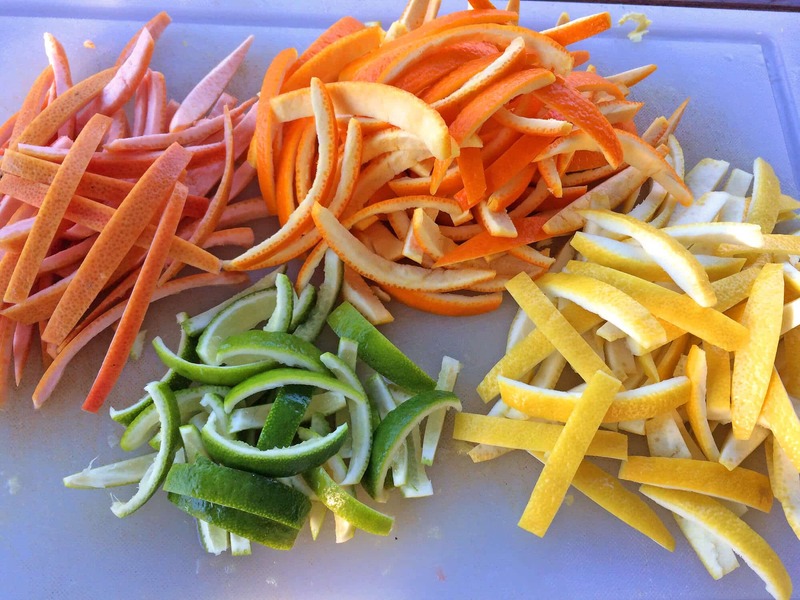 That’s terrific, Wayne, these homemade citrus peels will make EVERYTHING taste better! So awesome, Susan, thank you! As good as they are on their own, just wait until you’ve tried them in some baked goods – heaven! 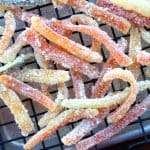 How much candied peel does this recipe yield? I need to make 3 cups of it for a recipe. I made candied orange peel a couple years ago at Christmas. Want to repeat this year with grapefruit, lemon and lime too. Do you boil all types together and does that muddle the taste or do you still get the distinct flavors when you boil all the different peels together? Hi Mindy, the leftover syrup itself will be a blend of flavors (very tasty) but I find the individual peels still retain their own distinct flavors. Bummer. I tried and failed. My sugary syrup became very thick and turned brown. I stood over it stirring frequently. My stove is professional type heat. I am thinking my summer was too hot. I am not going to attempt it again today. Yours looks amazing! I removed it from the heat at 30 minutes but probably should have pulled it at 20 minutes. It is amber colored and is bitter. Kimberly, I just finished this recipe and tried to follow everything exactly. However, my candied lemons and oranges taste very bitter. In reading some comments above, should I have taken off all the pith? Any other reasons it could be bitter? Hi Monica, yes, it’s the pith that has the bitter taste. Some people like it and some prefer to remove the pith. It also comes down to what you’re using it for – eating it plain vs. baking it in things. When adding it to muffins, cakes, pastries, etc, you probably won’t notice the bitter flavor. I have just made some candied peels. Absolutely lovely. Such an easy recipe to follow. How can I have not made these before. I only had orange and lemon peel but they taste so fresh!! Thankyou!! YES!!! With your homemade marzipan in hand and now these homemade candied peels you are ALL SET for total Stollen success! :) I hope all your hard work pays off, Mary, please let us know how it goes! I have a question on storing fresh orange peels prior to making candy. For all of us who make fresh juice daily or weekly, Do you know if the leftover fresh peels can be stored in the refrigerator or even the freezer as they are collected prior to making candy. I always make a HUGE batch of candy so storing collecting and storing peels a few weeks ahead would be great. Thank you again for your incredible attention to your blog, your amazing recipes, and sharing with us!